Lubos made interesting comments related to the work of set theorist set theorist Paul Cohen. Cohen proved that axiom of choice (AC) cannot be proved nor disproved from Zermelo-Fraenkel axioms for set theory. He proved same also for continuum hypothesis (CH). Checking the definitions of various notions from Wikipedia led to an intellectual adventure of Sunday morning. As a physicist I tend to share the skepticism of Lubos concerning AC. Stating it more formally: given a collection of sets indexed by some index set and not containing empty set, one can select from each set single element. What AC says that Cartesian product exists as a set. For finite sets there is no problem but already for a Cartesian power of reals one has a problem. Can one really choose from each factor R single element? Physicist might regard this kind of choice as too strong an idealization since there is always a finite accuracy involved. One can fix a given point of real axis only in finite accuracy since in the real world one must always perform a cutoff on the expansion of the real number in powers of 10, 2, or prime, or any natural number larger than one.. Physicist might prefer to weaken the axiom to a choice of a finite open ball around a point. This would lead from set theory to topology. One could return to set theory by postulating discrete topology in which each point is an open set. Physicist has however motivations to believe that physical world obeys less trivial topology and metric topology with the notion of distance defining the concept of nearness is natural for physicist. One can characterize the measurement resolution in terms of the radius of the ball replacing point. In p-adic context the situation is simpler than in real context since p-adic open balls are either disjoint or nested. Also the ordering, which is un-necessary luxury below measurement resolution, is lost in p-adic context. Since we want to minimize thinking, this is is a good reason for cognition to be p-adic;-). TGD framework the notion of finite measurement resolution (cognitive resolution, numerical accuracy) plays a key role and has very powerful implications for the proposed mathematical framework of physics. For instance, the inclusions of hyper-finite factors relating closely to quantum groups often assigned to Planck scale represent finite measurement resolution at quantum level and at space-time and imbedding space level discretization become the counterpart for the finite measurement resolution at the level of geometry. In p-adic context total disconnectedness implies difficulties with the notion of p-adic manifold and with integration and TGD suggests a notion of p-adic manifold based on coordinate charts mapping p-adic manifold to its real counterpart so one can induce real topology and well-orderedness of reals to p-adic context. Also here finite measurement resolution plays a key role. Cardinal numbers are defined as cardinalities of sets: two sets have the same cardinality if there is a bijection between them. Ordinals in turn can be seen as ordered sets of sets: set theoretically a given ordinal is the ordered sequence of ordinals defined by the cardinalities of the sets of smaller cardinality. The successor axiom of Peano arithmetics is essential here. Finite cardinals and ordinals can be identified but the notion of infinite ordinal is more refined notion than that of cardinal: this is obvious from the fact that infinite ordinals x and x+1 are not equivalent unlike corresponding cardinals. Power set axiom states that the set of subsets of set exists. The cardinality of the power set is larger than the cardinality of set. In the case of natural numbers the cardinality of power set would be the cardinality of continuum and CH states that there are no cardinals between cardinality of natural numbers and cardinality of continuum postulated to that for the power set of natural numbers. CH can be extended to apply to any set and its power set. Cohen suggests that CH is not true although he only proves that both CH and not-CH are consistent with ZF axioms. The notion of infinite prime provides number theoretic notion of infinity, which does not seem to reduce to the notions of infinite ordinals and cardinals. There is infinite hierarchy of infinite primes and infinite integers have a detailed number theoretic anatomy distinguishing them from cardinals and also "ordinary" ordinals. Infinity ceases to be some kind of limit and becomes something quite concrete expressed by an explicit formula having as a basic building brick the products of all primes at levels below a given level of hierarchy expressed as formal variables. Physically this infinite hierarchy corresponds to a repeated second quantization of an arithmetic quantum field theory. The many-particle states of previous level become elementary particle states of the new level. Simple infinite primes correspond Fock states consisting of fermions and bosons labelled by prime valued "energy". There are also not so simple infinite primes analogous to bound states, which is rather interesting from the point of view of quantum field theories. Many-sheeted space-time could serve as a natural space-time correlate for this hierarchy in the sense that even galaxy sized objects could be seen in some aspects as elementary particles and proton could be also characterized as elementary fermion at particular level of the hierarchy. The construction of infinite primes can be easily understood in terms of repeated second quantization. The Dirac vacuum is what one starts from and is at the first level of the hierarchy identified as the product X1=∏i pi of all ordinary primes. At the level n one has objects Xk, k=1,..n with Xk defined as the product of all primes belonging to levels m<k. At the lowest level simple infinite primes are obtained by dividing X with a square free integer m and adding to the result m: X→ X/m+/- m. The physical analogy is kicking of the fermions corresponding to prime factors of m from Dirac sea to positive energy states. After this one can add bosons (pm corresponds to m particles with "energy" p). One can also multiply X/m by an arbitrary integer n having no common factors with m: its decomposition to prime powers tells the numbers of bosons in corresponding modes. It is also possible to multiply m with integer r with any integer consisting of primes dividing m: also now the powers characterize the boson numbers in various modes. By construction nX/m and rm have no common prime factors so that the infinite integer is nmX/m+/- rm represents infinite prime. Depending on the sign factor one obtains two kinds of primes and X+/- 1 represent the simplest infinite primes and obviously differ by 2. Side remark: One can add to/subtract from X+/- 1 any integer and obtain an integer always divisible by some prime (any prime factor in the prime decomposition of X). One obtains therefore infinitely long range of infinite integers containing no primes. Analogous theorem for finite integers states that the range defined by the numbers n! +m, 0≤ m<n+1 contains no primes. How do infinite primes and integers relate to the axioms of set theory? I am not a set theorist and can make only some observations of a dilettante. In the following I restrict the consideration to the infinite primes at the lowest level so that they have only ordinary primes below them. The notion of infinity emerges in two different manners in the construction of infinite primes. How the infinite size of a given infinite prime relates to the infinite cardinals and ordinals? To me the relationship is not obvious. The number theoretical anatomy of infinite primes and the hierarchy of Dirac seas Xn defined by products of primes at various levels seem to distinguish the notion of infinite natural number from infinite ordinals and cardinals. In particular, infinite prime at a given level (first level now) has infinite number predecessors at the same level. Hence bi-directional ordering seems to replace ordinary uni-directional ordering of natural numbers. Does this mean something genuinely new or can it be reduced to set theory? Certainly it is difficult to imagine a set having number of elements given by infinite prime: infinite prime is more like energy than a number of elements. What is the number of infinite primes/integers/rationals at given level of hierarchy and how it relates to the notions of infinite cardinal and ordinal? The number of infinite primes at given level depends on what one allows. Consider the construction of infinite primes at the first level. The numbers n and m could be chosen to be finite. In this case the number of simple infinite primes would be the number of finite rationals n/rm. This implies denumerably of simple infinite primes (cardinality is same as for natural numbers). If one allows n or m to have infinite number of factors, the choices of m correspond to the set of subsets of finite primes and the resulting set is not denumerable and larger than the set of natural numbers (by CH it would be same as the cardinality of reals). One can argue that since the states with infinite fermion or boson number have infinite energy as physical states, they should be excluded so that the simple infinite primes would form a denumerable set. This result might generalize also to not so simple infinite primes, and might hold true at all levels of the hierarchy. Finite energy would correspond to denumerability. One can of course, ask "What about the entire Universe": should it correspond to the limit when the hierarchy level approaches infinite or to infinite particle numbers. Infinite primes relate in an interesting manner to AC and so called well-ordering theorem often thought to be one of the holy truths of set theory. Well-ordering theorem states that every set can be well-ordered. The existence of well-ordering of course depends on axiomatics. For real numbers well-ordering is natural and generalizes to Cartesian powers of reals in obvious manner. In p-adic number fields well-ordering is not possible if one stays with the restrictions of p-adic topology. As already mentioned, canonical identification map to reals can induce well-ordering of positive reals to p-adic context. To my opinion the status of AC is not a mere academic question even for physicist. Banach-Tarski paradox illustrates this. If AC is true, one can decompose sphere into parts and re-arrange them by using only rotations and translations, which are volume preserving operations, so that the volume of the resulting sphere is two times larger than the original! The operation involves a construction of non-measurable sets having no well-defined volume and an infinite number of choices. This result would suggest that set theory alone is not enough for the needs of physics. The notion of measurable set is needed. Well-ordering theorem is implied by AC. By definition set X is well-ordered by a strict total order if ever nonempty subset of X has a least element. This seems to be essential for the induction hypothesis generalized from naturals to infinite context: in induction the first step is to show the triviality of the theorem for n=0 and then show it for arbitrary n using induction hypothesis. For infinite positive integers at given level the least element does not however exist. Consider the infinite integers at the first level of the hierarchy. Infinite primes nmX/m -rm are always positive but there is no smallest infinite prime of this kind. In fact, also the integers X-n have no lower limit just as X+n do not have any upper limit. One can have a least element only by allowing a jump to a lower level, and this limit is of course 0. Unless one is ready to make this jump, well-ordering theorem is not true and therefore also AC cannot hold true. Maybe one could replace the uni-directional induction by bi-directional induction for infinite integers. Several bloggers have already commented the new Planck data (28 articles!). The posting of Phil Gibbs explains in some detail what is measured and what are the basic results from the point of view of cosmology. Second blog posting discussing the results from particle physics point of view is by Resonaances. The basic observable are the temperature fluctuations of cosmic microwave background coded by the correlation function for the local CMB temperature and deducible from the data. The correlation function is expressible in terms of spherical harmonics which are functions of the angular separation Ω for the points of celestial sphere. The role of standard model is played Λ CDM model involving cosmological constant and cold dark matter. Inflationary scenario is behind this model. The basic prediction is that the spectrum is Gaussian just like density fluctuations are predicted to be Gaussian. This is the simplest option that one can assume. The amplitude of the density fluctuations (and thus temperature fluctuations) is one of the non-trivial predictions. Although I am not a specialist, I dare to guess that Gaussian character dictates the predictions to a high degree. As Phil Giggs describes, the new data provide a much more accurate view about temperature fluctuations since higher harmonics l, which corresponds to higher scales of angular (and therefore also length scale -) resolution for a given distance/redshift, are included. The highest angular resolution is .1 degrees for Planck data. The data allow to deduce fractions of of dark energy, dark matter, and visible matter as 69.2+/- 1 %, 25.8+/- .4 %, and 4.82+/- .05 %. Also the age of the Universe can be estimated. The age of the Universe comes as 13.82 +/- 0.05 Giga-years. From particle physics point of view the interesting outcome is the estimate for the number of light neutrinos which is now Neff=3.3+/- 0.5. This does not support the idea about inert neutrinos having been in thermal equilibrium with other particles. This results is interesting also from TGD point of view (see also the earlier posting Is there an inert neutrino there?) since right handed neutrino has an exceptional role in TGD and despited the fact that it has no spinor couplings to induced electroweak gauge fields, one must consider also the possibility that via its coupling to the space-time geometry via modified Dirac equation it has managed to achieve a thermal equilibrium with other particles during early cosmology. 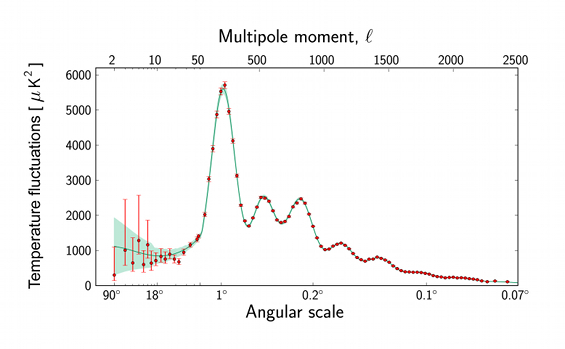 There are two kinds of anomalies associated with small angular momenta: amplitude anomalies and directional anomalies. Anomalies at the low frequency end. 2.5 to 3 sigma significance. Anomalies appear at large angular separations and thus large length scales hinting about the existence of unexpectedly large structures. By Uncertainty Principle of harmonic analysis large angular distances correspond to small "angular momenta" and lowest spherical harmonics. The correlation function for the temperature fluctuations at two points of celestial sphere can be developed in terms of spherical harmonics as a function of Ω=(θ,φ) defining the relative angular coordinates of the points. 〈le; T(Ω1)T(Ω2)〉le;= ∑l,| m|=0,...,lQlmYlm(Ω) . Ql,m are multipole strengths. Inflationary cosmological predicts Gaussian distribution in for the fluctuations as function of the angular separation. This leads to predictions for the coefficients of Ql,m. Dipole anomaly is the lowest anomaly but can be identified in terms of the motion of Earth with respect to CMB and by a suitable choice of the rest frame it can be eliminated. There are anomalies for also higher harmonics in Planck data up to l=10 at least. Higher harmonics are not shown in the graph of the posting of Phil Gibbs. For these values of l, odd harmonics are stronger whereas even harmonics are weaker than predicted. Why this? To a given l one can assign direction as direction Ω for which lth contribution ∑mQlm2Yl,m has maximum of modulus squared of this contribution. These directions are expected to be random. For small even values of l they tend to be aligned with each other and with what is called Axis of Evil, which is almost in the orbital plane of Earth. The celestial direction angles of the Axis of Evil are (RA= 212 o, δ= 25 o). A short digression: Right ascension RA and declination δ relate to spherical coordinates Ω=(θ,φ) via the relationship (δ= π/2-θ, RA=φ). δ is the counterpart of Norther latitude and RA the counterpart of eastern longitude. RA =0 holds true, when the center of Sun is in the plane as the Earth's equator (note that spin axes of Earth is slightly tilted with respect to the orbital plane (see this ). Axis of Evil points to a region in which the number of radio galaxies is lower than expected: the size scale of this low temperature region is 300 MPc (109 ly). The alignment of galactic spin directions along this direction. Possible explanations for the Axis of Evil has been discussed. The first article that web search gave was Goodness in the axis of evil by Schild and Gibson. The article relies on WMAP data but gives a glimpse about the problem for the interested reader. The abstract of the article mentions the unexpected alignment of 2-4-8-16 cosmic microwave background spherical harmonic directions with the direction of a surprisingly large WMAP temperature minimum ("Axis of Evil") defining a large low temperature structure and radio galaxy void. This cold region is not in the same direction as the Cold Spot for which one has RA= 3h 15min 5s and δ = −19o 35' 02". 3h makes roughly 3× 30=90 degrees as anyone familiar with clock can conclude). The authors do not state that odd harmonics would lie in the direction of Axis of Evil: what the situation is for the new data is not clear to me. Article mentions also the unexpected alignment and handedness of galaxy spins in the same direction up to distances of order 1.5 Gpc (pc= 3.26 Iy). The size scale of the low temperature radio galaxy void is 109 ly to be compared with the size scale 108 ly of large voids, which seem to form a honeycomb structure (for which I have considered a model based on many-sheeted space-time). I tend to agree with the authors that these long range correlations can be seen as a serious challenge the Λ QCM model which assumes cosmological constant, inflation, and cold dark matter. In TGD framework a natural explanation for the Axis of Evil would be in terms of long galactic cosmic strings. Note that these cosmic strings have only name in common with the ordinary GUT cosmic strings. As mentioned in Not Even Wrong, Planck data show now evidence for GUT cosmic strings. Cosmic strings in TGD sense are key players of TGD inspired cosmology. During primordial period they corresponds to string like objects with 2-D CP2 and M4 projections and later their M4 projection expands so that it becomes 4-D. The outcome is Kähler magnetic flux tubes with Kähler magnetic fields explaining the magnetic fields filling the Universe but having no natural explanation in standard cosmology. Since magnetic monopole flux having purely topological origin is in question, these fields need no current as source as ordinary magnetic fields. Kähler magnetic energy is identifiable as dark energy and the magnetic tension gives rise to the "negative pressure" needed to achieve accelerated cosmic expansion. The flux tubes can decay to ordinary and dark matter in the same manner as inflaton type fields are assumed to decay the ordinary and dark matter in inflationary scenarios. In TGD framework the flatness of 3-space corresponds to quantum criticality (no scales) rather than inflation. The Kähler magnetic energy of galaxies are assumed to be located along these string like objects like pearls along necklace. The correlations between galactic spins could be inherited from primordial period when galaxies were very near to each other and their dynamics were correlated. One should understand the amplitude anomalies in terms of this model. Why even harmonics have weaker amplitudes and odd harmonics stronger amplitudes than predicted? Could one say that some power has been transferred from even to odd harmonics? Why odd parity amplitudes would be stronger? How the selection of preferred axis by the presence of cosmic string could be responsible for this effect. Platonic solids and Golden ratio are in central role in what some people call sacred geometry. I know that the average colleagues cannot tolerate words like "sacred geometry". In my humble opinion names (nor even Names) do not matter much, and one should look for what is behind the names. These Platonic structures are extremely interesting since they relate to discrete and finite subgroups of 3-D rotation group characterizing the symmetries of also biomolecules. In particular, tey involve Golden ratio known to pop up again and again in biology. They also relate to the inclusions of hyperfinite factors and there exists a fascinating correspondence discovered by McKay between the discrete subgroups and laced Lie algebras. For instance, exceptional Lie groups correspond to tetrahedron, octahedron, and icosahedron in McKay correspondence. The following considerations suggests that tetrahedral and icosahedral geometries might have deep connections to biology and genetic code in the sense that genetic code could have geometric representation in terms of tetrahedrons and icosahedrons. For more details see the article Could one find a geometric realization for genetic and memetic codes? and for background the article What are the counterparts of Einstein’s equations in TGD?. In the following I try to represent the ideas as "slides" (used originally as a synopsis of a Skype discussion) for an imagined audience (this is just a trial motivated by my laziness). The problem of sacred geometrician (icosahedron consists of 20 tetrahedrons which are quite not regular) has a solution which requires deformation of Euclidian space to 3-sphere locally. This is possible in sub-manifold gravity. This is not however enough: this sub-manifold gravity must be strong. TGD predicts both sub-manifold gravity and a hierarchy of strong gravities. Could symmetry breaking for icosahedron assign to a given face of icosahedron a unique amino-acid? What could select this face so that one could say that one particular icosahedron corresponds to a given amino-acid? Does it involve gluing of amino-acid to particular face? TGD predicts besides genetic code also memetic code. Combinatorial hierarchy defined recursively M2= 3 ,M3=7, M7 =127, M127= 2127-1,... The lowest Mersenne numbers are primes. The rest also if Hilbert was right. One can assign codes to these Mersenne primes. Number of codons: 23-1=4 for M3, 27-1= 64 for M7 (genetic code). 2127-1= 2126 for memetic code. Genetic code corresponds to M7=127 and is followed by memetic code for which codewords correspond to 2126 sequences of 21 DNA codons. !21=20+1. Is this an accident? Could icosahedral geometry provide a geometric realization of memetic code? TGD suggests a dark realization of genetic code realized in terms of dark proton sequences. Genetic code realized at the level of dark nuclear physics! !Lowest magic numbers for nuclei correspond to the numbers of faces for tetrahedron (4), octahedron (8), and icosahedron (20). Could nuclear physics have a connection with dark geometry In nuclear string model the folding of nuclear strings completely analogous to protein folding to these shapes could indeed give rise to magic nuclei.
! ?Could memetic codons be realized as sequences of 21 dark protons folded to icosahedron with 20 faces +1 dark proton attached together with amino-acid to one face! Amino-acid sequences accompanied by sequences of dark memetic codons. Do proteins carry a huge amount of memetic information which we know nothing about!!??
! ?Could some parts of intronic portion of ordinary DNA realize memetic code chemically? Could cultural evolution as opposed to purely biological relate to the intronic portion of DNA? Could dark protons at cell membrane be connected by magnetic flux tubes to DNA codons could make possible topological quantum computations and evolution of software making possible cultural evolution? If so, cultural evolution would correspond also to the evolution of magnetic body leading to a hierarchy of levels of collective consciousness. Icosahedron (12 vertices, 20 faces ) is Platonic solid as are also tetrahedron, cube, octahedron, dodecahedron. Observation: Icosahedron consists of tetrahedrons, which are howevernot quite regular. The ratio of "surface" edges to radial edges is 1.05 rather than 1. Scaling does not help. Sacred geometrician does not feel happy;-). Is there any manner to obtain 20 regular tetrahedrons? !There is! If Euclidian 3-space E3 is replaced with 3-sphere S3, one obtains 20 regular tetrahedrons. Could gravitation modify distances by making space-time non-flat. Could gravitation allow to deform piece of E3 containing icosahedron to a piece of S3 so that one would have sacred geometry? !In TGD universe sub-manifold gravity allows to take a piece of E3 realized as 3-surface and deform it it CP2 directions to make it look locally like 3-sphere! One obtains 20 *regular* tetrahedrons! Is gravitational deformation physically possible? Gravitation according to General Relativity cannot produce local S3 geometry in scales of biology and and condensed matter physics. For a system with mass M the scale of piece of S3 would be Schwartschild radius rs= 2GM. This length scale is extremely short scale if one works in the scales of condensed matter. Even for Sun rs is only 3 km! Huge gravitational constant is require in order to have rs ∼ hbar/M, the Compton length of particle with mass M. G=∼ hbar/2GM2. Gravitation would be extremely strong.
! This need not be a problem! TGD predicts hierarchy of strong gravities assignable to p-adic length scale hierarchy. Gravitational constant has a spectrum of values. For instance, inside hadrons gravitation is strong and gravitational constant is about 1038 times larger than ordinary gravitational constant. Only in very long length scales gravitation gets extremely weak. Size of piece of S3 of order GstrongM and can be of order of the size of say atomic nucleus or of icosahedral water molecule cluster.
! TGD predicts a fractal hierarchy of scaled copies of hadron physics and thus also strong gravities. In biology these scaled copies would be especially important in 10 nm- 5 micrometer length scale range. G= (Lp2/hbar) × exp(-SK(CP2)) , Lp2 = p × R2(CP2) . Here R(CP2) is CP2 size of order 104 Planck lengths. SK(CP2) is Kähler action for a deformation of CP2 type vacuum extremal representing graviton line of a generalized Feynman diagram as a deformation of CP2 type vacuume extremal. In long length scales, the magnitude for the value of Kähler action becomes maximal, and one obtains ordinary gravitational constant for p=M127 and αK equal to fine structure constant. M127 is the p-adic prime characterizing electron and largest Mersenne prime which does not correspond to completely super-astrophysical length scale. In short scales (short graviton lines) the strong gravitation limit G∼ Lp2 is approached since Kähler action becomes small. Hadron physics and its various fractal copies would correspond to strong gravities. Schwartschild radius rs= 2GM = 2Lp2M/hbar ≈ 2 Lp would be of order Compton length! !In sub-manifold gravity one can construct from pieces of S3 realized as 3-D surfaces in M4× CP2 large quasi-lattice like structures by gluing them together along boundaries. Icosahedrons decomposed of *regular* tetrahedrons could serve as a basic supercell. Could icosahedral water clusters in nanometer length scale correspond to this kind of quasi-lattice like structures? Could it be that strong gravitation is essential for living matter where ordered water plays a key role? Penrose and Hameroff speculated also that quantum gravitation important but the problem is that ordinary gravitation is so weak. Tetrahedron has 4 faces. DNA has for different code letters: A, T, C, G.
Icosahedron has 20 faces. There are 20 different amino-acids. Could A,T,C,G somehow correspond to faces of tetrahedron? Could amino-acids somehow correspond to faces of icosahedron? One must be able to achieve two things. To distinguish between faces of tetrahedron/icosahedron in order to assign them code letter or amino-acid. Symmetry breaking is required. !One can look these objects in two manners. In S3 geometry of the space-time sheet. Or in E3 subset M4× CP2 geometry of imbedding space! 4- and 8-dimension perspectives! The regular tetrahedrons of S3 geometry do not regular in E3 geometry! In the same manner the faces of icosahedron need not be identical in E3 geometry although they are so in S3 geometry. Could this be enough for the needed symmetry breaking or is more needed?! Need the breaking be purely geometric? To select one of the 4 faces of tetrahedron and one of the twenty faces of icosahedron in order to say that this tetrahedron represents particular code letter or this faces represents particular amino-acids. How to achieve this? TGD leads to a generalization of genetic code. The lifted Mersenne numbers are primes. The rest also if Hilbert was right. One can assign to these Mersenne numbers codes. Mn=2n-1: 2n sequences of n bits. Boolean algebra. One half of Boolean statements can be simultaneously true and define "axioms". Codes are axioms systems with 2n-1 axioms in the case of Mn. Number of codons is 23-1=4 for M3, 27-1= 64 for M7 (genetic code). 2127-1= 2126 for memetic code. The interpretation of the hierarchy is in terms of statements about statements about statements.... Reflective hierarchy of codes would give Combinatorial Hierarchy. Hierarchy of codes labelled by certain Mersenne primes. Genetic code corresponds to M7=127. 64=26 code letters. The next code after genetic code - memetic code - corresponds to Mersenne prime 2127-1, which is the p-adic prime characterizing electron and ordinary gravitation in long length scales. This code has 2126 =26× 21 = (26)21 codewords, which can be represented as sequences of 21 DNA codons. Huge amount of information! Could this code be realized for introns and be assignable to topological quantum computation. There are two further observations. First observation: number of DNA codons in memetic codon is 21 =20+1= number of aminoacids +1 (stopping sign as "aminoacid")? What could this mean!? Is there a connection between memetic codon, the number of amino-acids, and icosahedral geometry? Could it be that one could take DNA strand and fold it to icosahedral shape?! This would be like protein folding. Could one have 20 DNA codons forming icosahedron and 21:st glued to one of the 20 faces of the icosahedron? Could this select icosahedral face ↔ amino-acid? Could this involve also gluing of real amino-acid to the face? Could amino-acid sequences be accompanied by sequences of icosahedrons so that one would have realization of memetic code? Could amino-acid sequences much more that mere building bricks: software instead of mere hardware? Could huge amounts of hidden/dark information not realized chemically!? Could memetic code perhaps responsible for the cultural evolution be associated with aminoacid sequences? Second observation: DNA possesses pearls-in-necklace structure. Pearls identifiable as nucleosomes. Could they correspond to 21 DNA codons in icosahedral configuration? This need not be the case. There are 47 codons in single nucleosome. 2× 21+5. 2 memetic codons plus 5 surplus DNAs, which corresponds to 5 nm length: p-adic length scale L(149) defining thickness of lipid layer of cell membrane? Note that 5 DNAs correspond to a twist of π for DNA double strand. Why this? Could there be some other realization? Further observations lead to further ideas. Fifth observation:nuclear string model ↔ protein folding ↔ sacred geometries. In nuclear string model atomic nuclei correspond to folded strings. Protons are folded into string and neutrons too. The string structure orders the nucleons and is something new and in principle it should be possible to find tests for this. Folding of nuclear strings completely analogous to the folding of proteins! 4, 8, 20 are nuclear magic numbers. These are numbers of faces for tetrahedron, octahedron, and icosahedron. Sacred geometries! Is this a mere accident? Note that usual explanation in terms of nuclear shell model with harmonic oscillator potential. Sixth observation: in atto-second time scale water obeys chemical formula H1.5O. 1/4:th or protons invisible in neutron diffraction and electron scattering (see Chaplin's homepage). Where these protons lurk? !Could they be dark in TGD sense? Could they reside at dark space-time sheets and have non-standard value of Planck constant. This leads to a model for dark protons as protons lost by water molecules to dark space-time sheets. !The model for dark proton predicts that its states are in 1-1 correspondence with DNA, RNA, tRNA, and amino-acids and also predicts with natural assumptions that the numbers of dark "DNA type" protons which correspond to dark "amino-acid type" protons are same as the number of DNA codons mapped to a given amino-acid in vertebrate genetic code! Sequences of dark protons define dark nuclei as analogs of DNA codon sequences. Dark realization of genetic and possibly also memetic code . !This could make possible R keno& D department in which various genetic modifications could be tested and successful variants could be taken in use by transcribing dark genetic codons to ordinary ones. The very rapid evolution of genes related to immune system could involve active experimentation in the virtual world of dark genes and dark amino-acids. Evolution would not be a completely random process but an outcome of active experimentation just as the technological evolution is. Non-reductionistic side remark: No one considers seriously of throwing copper and silicon to pool and waiting the computers evolve from this soup! But this is how standard biologist would do.
! ?Could it be that dark DNA 21-plets folded to icosahedral configuration accompany amino-acid sequences! Each amino-acid would correspond to dark protonic string of 20 dark protons folded to icosahedron + 1 additional dark proton to which amino-acid is glued. Completion to memetic codon would select unique amino-acid!! Two flies killed with single blow!
! The folded dark proton string of 20 nucleons would correspond to especially stable magic dark nucleus having an icosahedral shape. Tetrahedral and icosahedral geometries assignable to water molecules to which one can assign dark protons.
! ?Could water molecule clusters accompany dark proton sequences? One can imagine two options. Water molecule has tetrahedral structure. H+ nuclei and two pairs of lonely electrons are in vertices of tetrahedron. Could water molecule be associated with a piece of S3 instead of E3? Could water molecules combine to form icosahedrons? One dark proton for each water molecule. ?Could this structure correspond to single dark DNA codon? The size might be too small. Ordinary DNA codons corresponds to 1 nm. Water molecules is roughly 10 time smaller. 14 water molecules form a regular tetrahedron and these in turn combine to form icosahedral water clusters (see the homepage of Chaplin about anomalies of water). This structure has nanometer scale. Could this structure define one dark genetic codon containing one dark proton? In this case one would have 1 dark proton per 14 water molecules. The consideration above were preceded by a development of ideas about preferred extremals of K&ayml;hler action. For preferred extremals of Kähler action energy momentum tensor of Kähler action must have vanishing divergence.This corresponds to local conservation of energy momentum. If Einstein-Maxwell equations with cosmological constant assumed, this is true. Λ and G emerge as predictions. This distinguishes TGD from general relativity and allows a hierarchy of strong gravitations assignable to scaled variants of strong interactions. These would be important even in condensed matter scales and living matter. ?Problem: Einstein-Maxwell equations with cosmological constant might allow too limited set of solutions. Does not make sense for vacuum extremals for which energy momentum tensor vanishes but Einstein tensor is non-vanishing. Would require infinite gravitational constant and vanishing cosmological constant. The interpretation of vacuum extremals suggests something more general. Einstein-Maxwell equations cannot be true for them. The solution ansatz guaranteing the vanishing of divergence of energy momentum tensor must be generalized. This is possible: two or three cosmological "constants", which are actually not constants! This was discussed in previous posting. Interpretational problem: Vacuum extremals are vacua of Kähler action but their Einstein tensor non-vanishing. Einstein equations say that there must be energy momentum associated with these vacuum extremals. What does this mean? !As I have suggested earlier, Einstein tensor characterizes the topologically condensed matter, smaller space-time sheets present and glued to the vacuum extremal space-time sheet. The sheet carries information about the energy momentum tensor of topologically condensed matter in its Einstein tensor. What are the counterparts of Einstein's equations in TGD? Whether TGD is consistent with Einstein's equations or not has been a continual source of worry and my interpretations have fluctuated. The working with a quite different problem forced however to ask the basic questions again and led to challenge the assumption inspired by the construction of preferred extremals that the local conservation of energy momentum tensor of Kähler action always forces Einstein-Maxwell action with cosmological term. As a matter, fact much milder conditions are enough to achieve this and imply the existence of several cosmological "constants" (not constants actually) multiplying mutually orthogonal projectors, whose sum replaces the ordinary cosmological constant term. This view unifies the two quite different interpretations of cosmological constant. The first - "Einsteinian" - interpretation is as a fundamental constant not characterizing real energy density. According to the second interpretation cosmological constant characterizes genuine contributions to energy assigned to inflaton type fields. In the recent case these contributions would correspond to topologically condensed matter such as K\"ahler magnetic flux tubes and particles. As a matter fact, this was the original interpretation, which I challenged after the discovery of preferred extremals. I glue below the abstract of the new chapter What are the counterparts of Einstein's equations in TGD?. The original motivation of this work was related to Platonic solids. The playing with Einstein's equations and the attempts to interpret them physically forced the return to an old interpretational problem of TGD. TGD allows enormous vacuum degeneracy for Kähler action but the vacuum extremals are not gravitational vacua. Could this mean that TGD forces to modify Einstein's equations? Could space-time surfaces carrying energy and momentum in GRT frameword be vacua in TGD context? Of course, also in GRT context cosmological constant means just this and an experimental fact, is that cosmological constant is non-vanishing albeit extremely small. Trying to understand what is involved led to the realization that the hypothesis that preferred extremals correspond to the solutions of Einstein-Maxwell equations with cosmological constant is too restricted in the case of vacuum extremals and also in the case of standard cosmologies imbedded as vacuum extremals. What one must achieve is the vanishing of the divergence of energy momentum tensor of Kähler action expressing the local conservation of energy momentum currents. The most general analog of Einstein's equations and Equivalence Principle would be just this condition giving in GRT framework rise to the Einstein-Maxwell equations with cosmological constant. One can however wonder whether it could be possible to find some general ansätze allowing to satisfy this condition. This kind of ansätze can be indeed found and can be written as kG+∑ΛiPi=T, where Λi are cosmological "constants" and Pi are mutually orthogonal projectors such that each projector contribution has a vanishing divergence. One can interpret the projector contribution in terms of topologically condensed matter, whose energy momentum tensor the projectors code in the representation kG=-∑ΛiPi+T. Therefore Einstein's equations with cosmological constant are generalized. This generalization is not possible in General Relativity, where Einstein's equations follow from a variational principle. The suggested quaternionic preferred extremals and the preferred extremals involving Hamilton-Jacobi structure might allow identification as different families characterized by the little group of particles involved and assignable to time-like/light-like local direction. One should prove that this ansatz works also for all vacuum extremals. If not, the local conservation of K¨hler energy momentum tensor would be the general formulation for the counterpart of Equivalence Principle in TGD framework. This progress - if it really is progress - provides a more refined view about how TGD Universe differs from the Universe according to General Relativity and leads also to a model for how the cosmic honeycomb structure with basic unit cells having size scale 108 ly could be modelled in TGD framework. For details see the article What are the counterparts of Einstein's equations in TGD? or the new chapter of "Physics in many-Sheeted space-time". The news about Moriond conference (for details see for the posting of Phil Gibbs) did not bring anything really new concerning the situation with Higgs. The two-photon discrepancy is still there although the production rate is now about 1.6 times higher than predicted. The error bars are however getting narrower so that there are excellent reasons to hope/fear that unexpected kind of new physics is trying to tell about itself. Also the masses deduced from gamma pair and Z pair decay widths are slightly different. The TGD-based explanation would be in terms of M89 hadron physics, a fractal copy of ordinary hadron physics with 512 times higher overall mass scale. If the pion of this new physics has mass not too far from 125 GeV its decays to gamma and Z pairs would affect the observed decay rates of Higgs to gamma and Z pairs if one assumes just standard model. Fermi anomaly suggests mass of about 135 GeV for the pion of M89 hadron physics. The observations of RHIC and those from proton-heavy nucleus collisions - correlated pairs of charged particles moving in same or opposite directions- could be understood in terms of decays of M89 mesons behaving like hadronic strings in low energies in the relevant energy scale. Lubos tells in his recent posting about 3 sigma excess for new charged and neutral particles with mass around 420 GeV. They would be produced as pairs of charged and neutral particle. M89 physics based explanation would be in terms of kaons of M89 hadron physics. The naive scaling by the ratio r=m(π+107)/m(K+107) of masses of ordinary pion and kaon predicts that the M89 pion should have mass m(π+89)= r× 420 GeV. This would give m(π+89)=119 GeV not too far from 125 GeV to affect the apparent decay rates of Higgs to gamma and Z pairs since its width as strongly interacting particle decaying to ordinary quarks and gluons is expected to be large. This mass however deviates from the 135 GeV mass suggested by Fermi data by 18 per cent. Update: The CMS data from Higgs came from Moriond (see for instance this and this) and tell that photon pair production rate is .78+/- .27 from the predicted rate. The mean value would be less than half of that found by ATLAS! The groups use different detectors so that the large difference could be due to statistical fluctuations. Unless it is due to the different assumptions in the data analysis! I believe that Higgs like state is here and might well behave just as the standard model tells it must behave. As an innocent outsider I however cannot avoid making innocent questions. Could the anomalies be there too? What these anomalies could tell about the new physics that was expected to emerge at TeV energies? And how much pre-existing beliefs affect the analysis in which one must know precisely what one is searching for ("Standard model explains everything! ", "Maybe there is new physics of expected kind, say SUSY, can be searched for", "Maybe even new physics outside the mainstream is worth searching for")? It is a pity that we have the next opportunity to answer these questions only after 2015. Science News tells about a finding that transplanted eyes located far outside the head of vertebrate can see without a direct connection to brain. The connection to spine is however present. The experimenters surgically removed donor embryo eye primordia, marked them with fuorescent proteins, and grafted them into the posterior region of recipient embryos. This induced the growth of the ectopic eyes. The natural eyes of recipients were removed. Fluorescent spectroscopy revealed the natural innervation patterns but none of the animals developed connections to brain. To determine whether the animals having only ectopic eyes could see the training system was divided to quadrants of water illuminated by either red or blue LED light, and experimenters gave slight electric shocks in a particular quadrant. What was found that about 19 per cent of animals with optic nerves connected to the spine learned to avoid the quadrant in which they received electric shocks. What experiments show that it is possible to see without neural connections to brain. The question is whether only the spinal cord or also the brain was involved with the learning. Probably neuroscientist could immediately answer this question but for an innocent layman like me the answer is far from obvious. Experimenters seem to think that brain is involved. As Douglas J. Blackinston, the first author of the paper "Ectopic Eyes Outside the Head in Xenopus Tadpoles Provide Sensory Data For Light-Mediated Learning," in the February 27 issue of the Journal of Experimental Biology, states "Here, our research reveals the brain's remarkable ability, or plasticity, to process visual data coming from misplaced eyes, even when they are located far from the head." If brain is involved and the learned response is not a mere reflex involving only the spine, there must be information transfer to brain - perhaps along spine - but not as nerve pulses. In TGD framework these findings inspire several questions. Does the ability to see colors mean that visual colors are perceived at the level of retina rather than brain? The phenomenon of phantom limb supports strongly the standard view that various qualia emerge at the level of brain. On the other hand, the almost-prediction of TGD inspired theory of consciousness is that the primary sensory percept - and therefore also color qualia - can be assigned with the sensory organs. In TGD framework brain and body are 4-dimensional so that the pain in non-existing limb would be pain in the real limb of the geometric past. Brain would build cognitive representations - standardized mental images - about the sensory input by decomposing the perceptive field to objects. Brain would of course induce also motor response by associating to these standardized mental images motor actions. In order to build standardized mental images brain would generate feedback as a virtual sensory input to the sensory receptors. Virtual sensory input would be realized using what I have called dark photons having "topological light rays" as space-time correlates and assignable to the magnetic flux tubes connecting body parts together. Two new notions are involved: magnetic body - the primary intentional agent - and the signalling using photons, which are dark in the sense that they are characterized by a large effective value hbareff of Planck constant coming as an integer multiple of hbar so that for say energy of visible photon the wavelength can be much longer than micrometer. It has of course known for a long time that EEG carries precise information about the state of brain, and the natural question is why so? Magnetic body must receive data from biological body and the hypothesis is that EEG and its variants and possible scaled variants of EEG involving dark photons with large enough value of Planck constant to make their energies higher than thermal energy make this communications possible. Dark photons would be assigned to what I have used to call "topological light rays" assignable to magnetic flux tubes. The basic functions of EEG would therefore be communication to and control by magnetic body. For instance, quite recent experiment involved two rats as model animals. The first rat learned to press one of the two levers in response to a light signal over the correct level to get the reward. Second rat received the EEG response of the first rat and learned to respond in the same manner on basis of this response only so that this sensory response served as a virtual sensory or cognitive input for it. Magnetic body would generate also motor response using brain as a control instrument. Is the motor response in the recent case a kind of reflex action using only spine? Or are brain and magnetic body involved? Certainly the magnetic body could use brain as an intermediate control instrument. How much of the plasticity usually assigned with brain is actually flexibility of the magnetic body? And who is learning: is it brain or the magnetic body? The communication using dark photons and the presence of magnetic body would make possible the participation of also brain to the learning process. For instance, the communication from the ectopic eye to brain could utilize quantum coherent dark photons travelling along the route ectopic eye → appropriate layer of magnetic body → brain. One can imagine also a dark photon communication along magnetic flux tubes parallel to spine.